On Wednesday, Republicans joined Democrats to pass a resolution to end US support for the Saudi-led coalition in Yemen’s brutal civil war despite the Trump administration’s support to the nation’s monarchy, just as it has backed Saudi Arabia’s royalty in the aftermath of Jamal Khashoggi’s killing. The crisis is constitutional and is bound to bear on the political fortunes of either country. If it was Theresa May’s United Kingdom on Tuesday, it was Donald Trump’s United States of America on Thursday. In a resounding rebuke to the presidency, the Senate has voted to overturn his declaration last month of a border emergency in order to divert taxpayer funds to the US-Mexico border. Altogether a double whammy, if ever there was one. Having first rejected and then considerably truncated the White House demand for enormous funds to construct a border wall, the Senate has now blocked the President’s move to divert billions in funding the wall without the approval of Congress. Additionally, the closure of America for close to three months made confusion worse confounded. 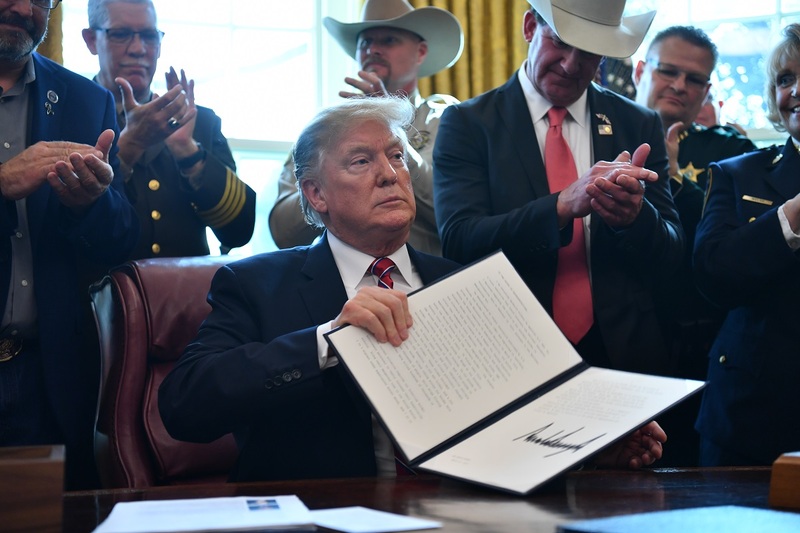 The legislative snub last Thursday has been greeted by the ebullient President with the threat to use his veto powers. Should it materialise, America will have to countenance a severe constitutional logjam. There is a message too in the rare pattern of voting. In a 59-41 vote, 12 Republicans joined every Democrat in the Senate ~ an exceptional case-study on defections, indeed the concert of rival parties in a fractured Congress. Thus was the President’s initiative thwarted. His somewhat rhetorical chant prior to the vote has had no impact on the figures that have led to the rebuff. To forestall defections, he had warned Republicans that a “vote for today’s resolution by Republican Senators is a vote for Nancy Pelosi, crime, and the open border Democrats!” For all that, Trump ultimately failed to address the concerns within his party that the action violated the Constitution’s principle of separation of powers, which gives to Congress the power to handle finances. The bipartisan tally is a robust condemnation of the President’s emergency declaration. The vote marks the second time in as many days that Senate Republicans have defied the President. On Wednesday, Republicans joined Democrats to pass a resolution to end US support for the Saudi-led coalition in Yemen’s brutal civil war despite the Trump administration’s support to the nation’s monarchy, just as it has backed Saudi Arabia’s royalty in the aftermath of Jamal Khashoggi’s killing. In yet another development that is testament to Trump’s sliding image, Republicans joined Democrats on Thursday to turn the screws on his election. In an overwhelming show of support for a non-binding resolution, both parties demanded that the Department of Justice make public the findings of the special counsel, Robert Mueller, and the investigation he has been leading for almost two years into allegations of Russian interference in the 2016 presidential election. Both rebukes of the President’s actions could well be turning-points. The legislature has set its face against a national emergency. As crisis piles on crisis in Trump’s America, so too do the setbacks.